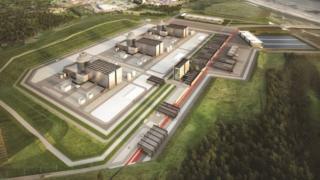 Toshiba's decision will dent the UK's plans to develop new nuclear power stations. "After considering the additional costs entailed in continuing to operate NuGen, Toshiba recognises that the economically rational decision is to withdraw from the UK nuclear power plant construction project, and has resolved to take steps to wind-up NuGen," the Toshiba statement said. "Relying in this way on foreign companies for our country's essential energy needs was always irresponsible," said its national officer Justin Bowden. "A new nuclear power station in West Cumbria remains vital for the UK's future energy security and requires urgent action." In September NuGen announced it was reducing its team at Moorside from more than 100 to fewer than 40 - leading to speculation the plant's development was in jeopardy.